Lot:50165 1982年阿拉伯联合酋长国中央银行5 & 10迪拉姆。序号8。Gem Uncirculated. 1982年阿拉伯联合酋长国中央银行5 & 10迪拉姆。序号8。Gem Uncirculated.UNITED ARAB EMIRATES. United Arab Emirates Central Bank. 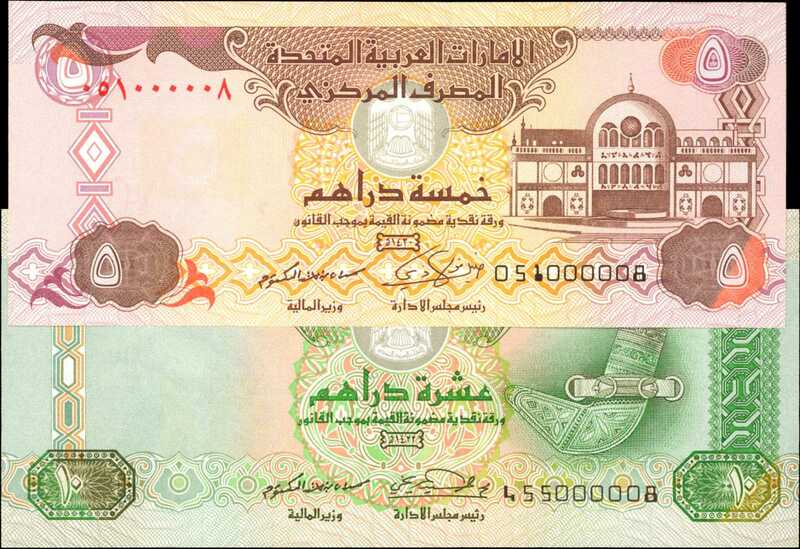 5 & 10 Dirhams, ND (1982). P-7 & 8. Serial Number 8. Gem Uncirculated.2枚一组，色彩明丽的Gem级纸钞，序号均为000008。From the Lucky Number 8 Collection of Hassan Al-Naimi.